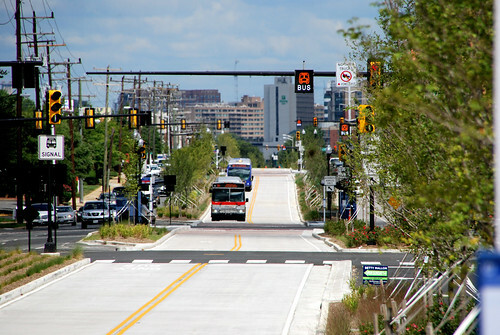 That's why I'm honored to have Adam here again with a three-part series on Montgomery County's Bus Rapid Transit plan. While BRT could be a boon for the county's future, it's mired in controversy. But why? In part two, we'll look at the disconnect between who benefits from better transit and who participates in the discussion over making better transit. Also check out part one and part two. Veirs Mill Road today. Photo by the author. The County Executive has proposed state legislation calling for a new independent transit authority that would build and run a new countywide BRT system in addition to the county’s existing Ride On bus system. The authority would not be subject to County Council oversight and would have the power to condemn property, sign contracts, set fares and issue bonds. The full cost of building a 10-route, 81-mile system was last estimated at nearly $3 billion and could tack on 20% or more to residents’ property tax bills. After significant public pushback, the county’s state legislators balked and the proposal collapsed. For now. Is this the end of BRT? It better not be. The county desperately needs to enhance its transit capacity if it is to remain competitive with the rest of the region. The key to gaining public support for BRT is to show residents what this transportation mode actually looks like without a tax hike. If they see it, ride it and like it, they just might be willing to pay for more of it. There’s a way to get that moving right now. Map of the proposed Veirs Mill Road BRT. Image from Montgomery County. 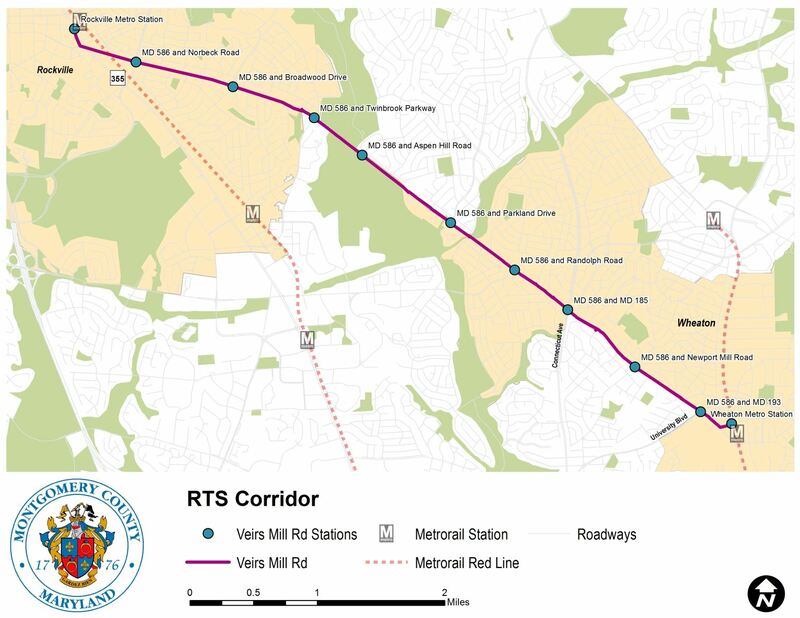 A BRT line connecting the Rockville and Wheaton metro stations via Veirs Mill Road has been on the county’s wish list to the state since before the current County Executive took office. 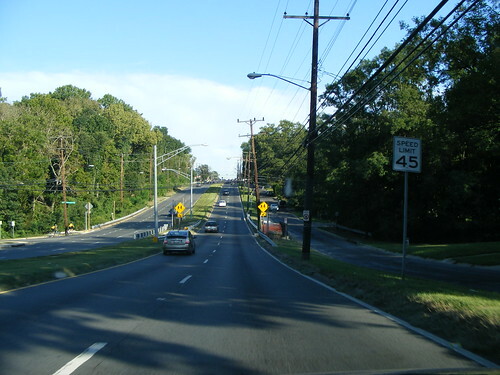 Even though Veirs Mill is a state road, the County Council chose to fund a development and evaluation study for the route with county money in 2008 (along with the now-canceled Georgia Avenue North route). Because plans for Veirs Mill preceded calls for a multi-route system, it is now further along in design than any other route. Connectivity: A Veirs Mill route would connect both legs of Metro’s Red Line. Along with the Purple Line, it would form a transit network connecting MoCo’s four largest central business districts: Bethesda, Silver Spring, Wheaton and Rockville. Right-of-Way: Nearly all of Veirs Mill has a fixed median and much of it has feeder roads. This right-of-way offers lots of options for setting aside bus lanes while minimizing private property acquisitions. Ridership: Veirs Mill is the location of part of Metro’s Q2 bus route, which WMATA describes as having“the highest Metrobus ridership in Maryland.” The state and county have called Veirs Mill “the most heavily used Metrobus route in Montgomery County.” In total, six Metrobus routes and five Ride On routes run along at least part of Veirs Mill. These routes together have 15,900-18,200 daily riders. The state and county estimate that a combined BRT-bus system on Veirs Mill could accommodate 32,790-34,121 riders in 2040. Lack of Opposition: Veirs Mill has been under study for several years and an open house meeting was held as far back as 2012. So far, opposition resembling the scale of Olney has not materialized. Economic Investment: Wheaton is attracting tremendous investment by both the public and private sectors. Its core will contain a new headquarters for Park and Planning and several other county offices as well as an accompanying residential project. A new library and recreation center will be under construction a few blocks north of the Central Business District. 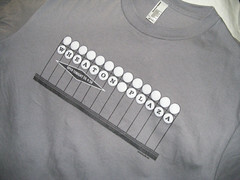 Westfield is planning new apartment towers just steps from the Wheaton Metro station. These projects together will bring hundreds of millions of dollars in public and private investment into Wheaton. A BRT route would make an excellent anchor for this development and would encourage future economic growth. Cost: Parsons Brinckerhoff estimated Veirs Mill’s capital cost at $126 million and its annual operating and maintenance cost at $3-4 million in 2011. Vanasse Hangen Brustlin estimated its capital cost at $283 million and its annual operating and maintenance cost at $5.4 million in 2013. While these costs are substantial, they fall far short of total system costs (likely to be in the billions for capital and over $150 million a year for operations). This scale of cost is affordable within the county’s existing capital budget, which is called the Capital Improvements Program (CIP). The CIP is a six-year budget plan currently containing $4.5 billion worth of building and transportation projects. By its nature, it is a very fluid budget. Discrete capital projects – like, for example, a new elementary school or an intersection improvement – enter the CIP with each new iteration and leave it when they are completed. Level-of-effort projects – like, for example, money set aside for street repaving – can be adjusted depending on need and budgetary circumstances. Projects change, get delayed and move around the schedule. The county’s Office of Management and Budget and the County Council’s capital budget coordinator, Glenn Orlin (who is also the council’s transportation expert) re-work the CIP’s schedule each year to balance the county’s capital needs and keep the projects on track. A Veirs Mill BRT project is not a small one given its cost, but it could fit in the existing CIP without mass disruption of other projects. It costs less than the $357 million M-83, a new highway the county’s Department of Transportation is studying that runs through wetlands. The bottom line is that this route can be built without a tax increase. Well, now he has. The county can stay stuck in an all-or-nothing approach to BRT. Or it can break the gridlock by proceeding with a pilot route on Veirs Mill Road, which could be a game-changer with the public. 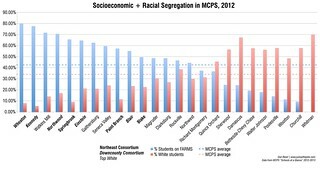 What are you waiting for, Mister Leggett? Build it now! This makes a lot of sense and seems a much better value for taxpayers than a lot of other transportation proposals that are being discussed!